As of this weekend, the device that changed how we listened to our music and watch videosÂ turnsÂ 10 years old. Before then, most people listened to their music on CDs. Steve JobsÂ launched the portable media player on 23 October, 2001. As of releasing that device, the world fell into the iPod craze. Upon the release of the iPod, it held 5 or 10 GB worth of music, a minimum of about 1,000 songs while a CD player can hold about 20 songs per disc. Since itÂ originalÂ launch, the style has evolvedÂ over the years. One of theÂ significantÂ change is the wheel. In itsÂ originalÂ launch, the iPod had a mechanical scroll wheel with the buttonsÂ aroundÂ the mechanical scroll wheel. The second generation iPod changed from the mechanical scroll wheel to a touchÂ sensitiveÂ wheel . The thirdÂ generationÂ iPod resigned the touch interface and introduced the dock connector. 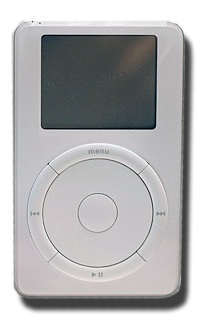 The fourth generation iPod introduced theÂ Click Wheel that is used on most iPods today. When the iPod was introduced, it used only the Firewire connector. After some time, Apple dropped the Firewire support to just charging only, then dropped it completely. Over the past 10 years, Apple has sold over 300 million iPodsÂ aroundÂ the world. It has alsoÂ carried the digital music revolution in a way none of its competitors could. Since the iPod was introduced, iTunes has always been the backbone of iPod’s success. Since it was introduced, iTunes has sold over 10 billion songs. As of right now, the iPod has many different models, including the iPod classic, iPod shuffle, iPod nano, and the iPod Touch (not to also mention the iPhone, iPad, and Apple TV that came from the iPod).